Hit the ground running as you meet the diverse Sioux Falls deaf community starting your first day of class at Augustana. Beginning very early in the Sign Language Interpreting program, students observe practicing interpreters while they are working in various settings. Our students observe and ask questions in order to decipher the demands that are presented to professional interpreters. We spend extensive time during class working on developing critical thinking skills in order to prepare students to make ethical decisions after graduation. Our students attend and host several Deaf community events each year while attending Augustana University. At these events, students have an opportunity to interact with the Deaf community in a natural environment and to acquire casual language as well as cultural awareness. 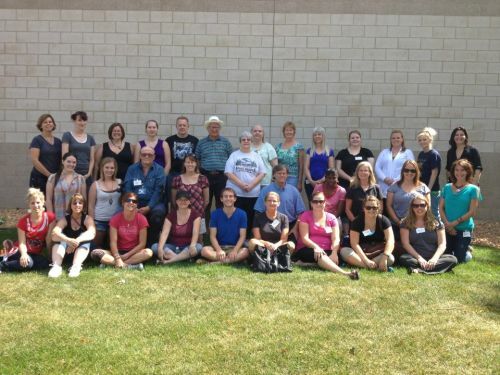 The South Dakota ASL Immersion was established in 2010 as a way to draw professional working interpreters, interpreting students and Deaf mentors together. All participants engage in three days of workshops and activities while focusing on American Sign Language. This event is housed on Augustana campus and hosted by the students and faculty. It is a great way for the students to interact with the Deaf community and continue to develop their skills during the summer months. During the spring of senior year our students begin the adventure of a lifetime by spending 35-40 hours shadowing a practicing interpreter. During this time, students have an opportunity to ask questions, observe professional interpreters at work, and learn the ins and outs of professional demeanor. In addition, students work to develop basic knowledge of the business aspect of interpreting. They work to develop a professional online presence, create a business plan, research tax laws in various states and gain a general understanding of interpreting entrepreneurship. Immediately following Practicum, students begin a 400-hour Advanced Interpreting Practicum (AIP) in which the student becomes the practitioner and the professional interpreter shadows the student. This is a fantastic culmination of their education. Many of the students are offered employment at the site in which they do their AIP experience.